Readers, this is an extraordinary book. The author is part of the critique triumvirate I am fortunate enough to belong to, but I'm not calling this work extraordinary because of that. It's been a long time since I could so wholeheartedly endorse a novel, but this one is special. I found it absorbing, deeply moving, and uplifting. I admire the writer's skill and subtlety, and I've come to love her characters. I heartily recommend this book. Do yourselves a favor and buy a copy here. The author pulls off quite a feat. She gives us a main character who is about as far from lovable as it’s possible to get: Ketch has a violent past, a truculent, antagonistic attitude, and many secrets. He is damaged on more than one level. And yet… even from the beginning we see his intelligence at work, his sense of justice, his compassion (even though he doesn’t recognize that quality in himself). One step at a time, incrementally, we begin to root for Ketch, until before we know it we’re a hundred percent on his side – and he is becoming a different man. This book is a gem. 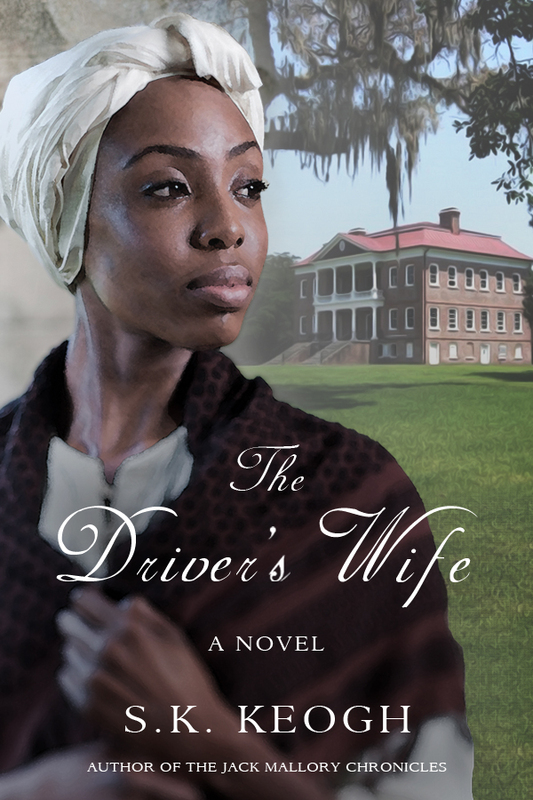 Its descriptions of the colonial south are lush and vivid, which enhances the whole, but the extraordinary depth of characterization is what makes this story something special. The two main characters are fully realized. Separately and together, they hold the reader’s interest and we can’t help but care about them and their budding relationship, which is as singular as it is inevitable. Secondary characters, too, are three-dimensional, especially Helen, the precocious and warm-hearted child who Ketch protects and loves. I would love to see a follow-up book someday about Helen as a grown woman. A lot happens to Ketch and Isabelle externally, but even more happens – and deeper changes occur – internally, which gives the characters and the book as a whole a rare depth and richness. This reader will not soon forget these people and their story. When Susan Keogh won an elementary school writing contest and a trip to a regional young writers conference, she hadn’t realized that experience was the beginning of a love affair with words. Keogh was raised in a large family where reading was encouraged. Through her mother’s interest in history, Keogh grew to admire such authors as Michael Shaara and Bruce Catton, a fellow Michigan writer who focused on the American Civil War. So it was no wonder that her first writing credit was a featured article in the magazine America’s Civil War. Keogh’s particular interest in the Civil War led her into re-enacting for several years as a field musician. 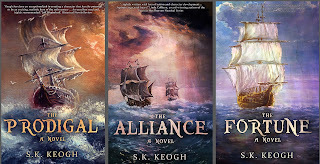 Keogh’s most recent time period of historical interest is early colonial America. She has crafted a series of novels that center around the adventures of Jack Mallory, a young Englishmen who is both pirate and eventually the patriarch of a large rice plantation in the colonial province of Carolina. 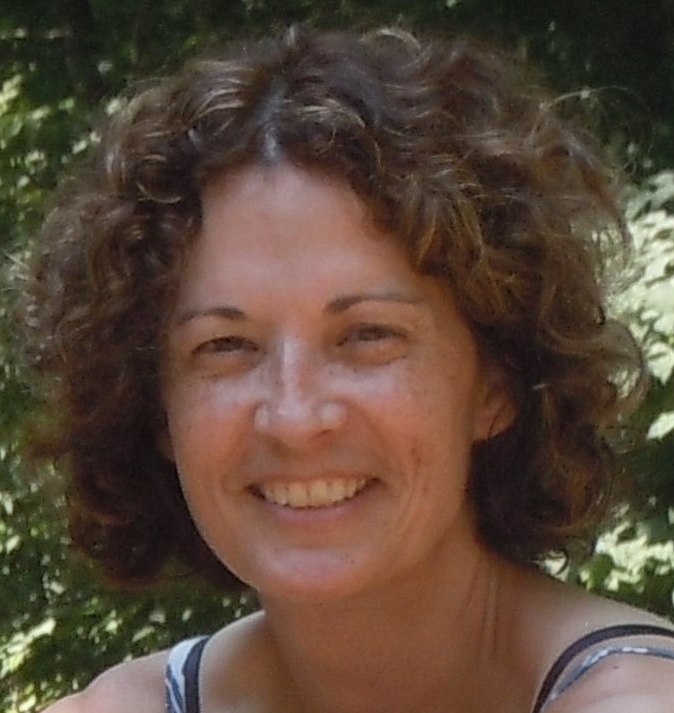 Outside of her writing life, Keogh works in the health care field and enjoys travel (preferably to warm places outside of her native Michigan! ), the arts, pickleball, and equestrian activities. 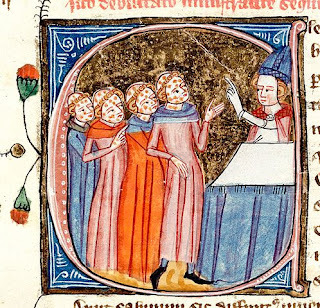 Tinney Sue Heath writes fiction set in medieval Italy. She didn’t originally intend to choose a bit of history that is obscure, often misunderstood, and has never been featured on a television miniseries, but that’s how it worked out. She was poking around in the Italian Renaissance when she got to wondering “Why then? Why there?” She took a tentative step back in time and promptly discovered a whole raft of fascinating stuff that happened before the Medici, before Michelangelo, before the Borgia pope. 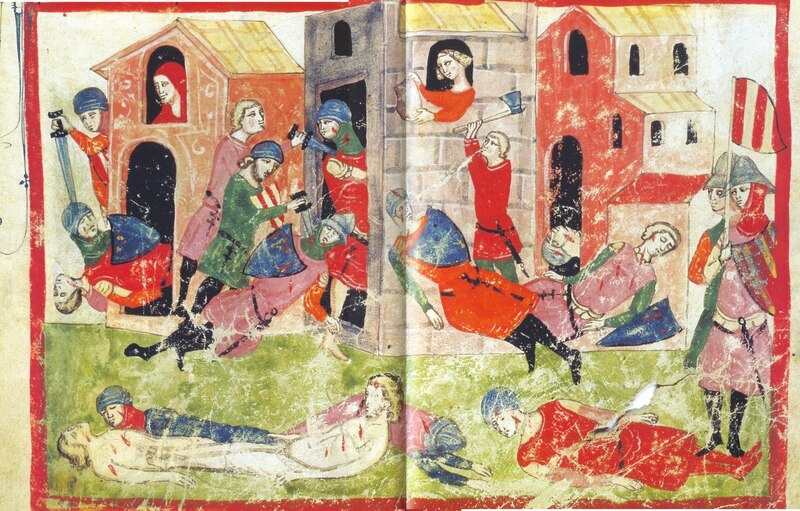 She picked up speed as she moved backwards beyond the Black Death, because, trust me on this, nobody wants to hang around in 1348. The Black Death is seriously depressing, hitting depths of yuckiness not even a dedicated historical fictionista can endure for long. Onward, ever backward, until she came to a screeching halt at Dante (1265-1321). If you're looking for the source of the Italian Renaissance, this is not a bad place to hover for a while. So Heath learned about those Guelfs and Ghibellines, about medieval urban warfare, about mighty defensive towers and magnificent frescoed churches, about an explosion of glorious poetry and a sea change in the visual arts, about Florentine magnates and the audacious experiment of rule by the popolo. And then she wrote her debut novel, and it turned out to be set in 1216. 1216? WTF? (Naturally, this stands for War-Torn Florence.) Does this mean she went further back in time and settled on a pre-Dante period? Not necessarily. 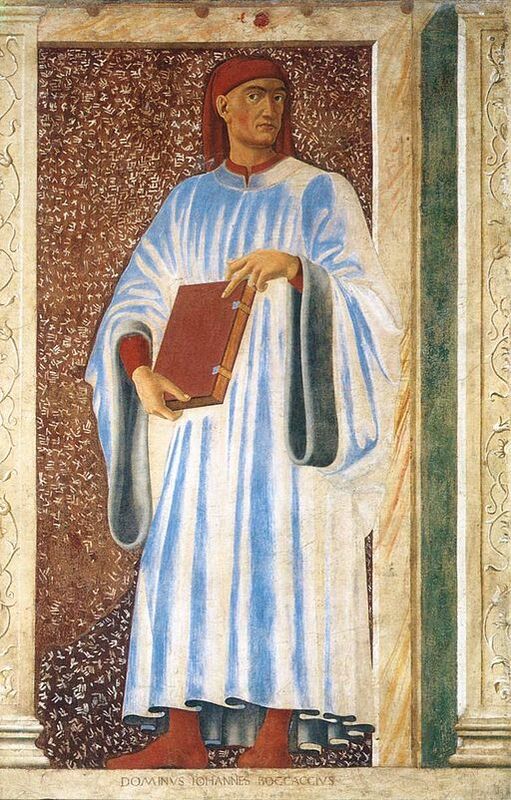 Dante was still compelling, but even in early 14th century Florence she found herself asking "Why him? Why then and there?" So backwards she went, yet again, until she hit that speed bump in 1216. She discovered a period rich in surprises, with all the vices and virtues of humanity prominently on display. 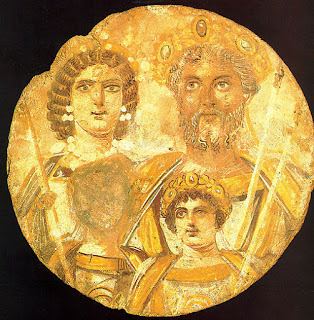 Plus, you get saints, not to mention all that complicated Guelf-Ghibelline, pope-emperor conflict. Her first book, A Thing Done, is based on an incident that triggered the Guelf-Ghibelline split in Florence. 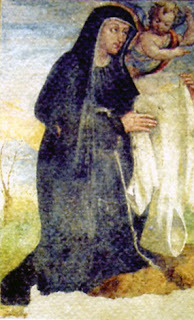 Her second (not yet published) novel, which begins in that same decade, involves the early Franciscans, with Saint Francis himself as a prominent - though not the main - character. Saints are a challenge to write about, and Heath claims absolutely no special qualifications in this area, but it's a wonderful exercise for the imagination. 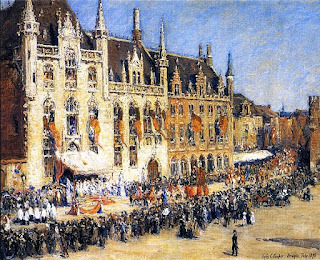 She finds in the ever-squabbling Guelfs and Ghibellines a parallel to the polarized politics of our own times, and it pleases her to think that if civilization made it through that mess, maybe we 21st century folk will also manage to muddle through. So if you want Tudors, or World War II love stories, or Roman soldiers, or guys in kilts, you'll have to look elsewhere. But be of good cheer, because you won't have any trouble at all finding those things in quantity. 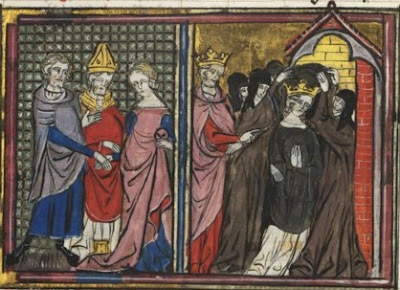 All you'll find here are those Guelfs and Ghibellines (occasionally trading places), saints and sinners (ditto), knights and ladies, jesters and cardinals, crusaders and monks. 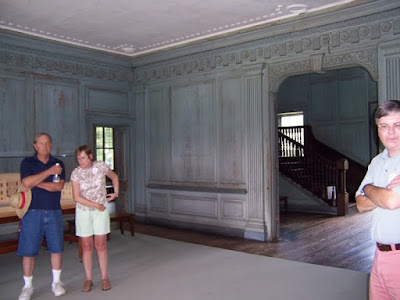 (There's less place-changing in those last three pairings, though anything's possible, and you just never know...) We're back in the days before glass windows, before wall fireplaces with chimneys, before the great upsurge of religious confraternities. 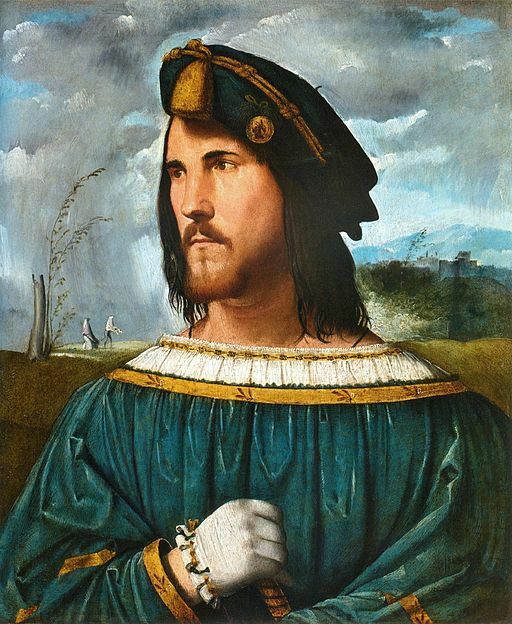 We're not done with the Crusades yet, the Uberti family would really love to take over the government of Florence, and just last year the pope ordered the bishops to stop including hunting dogs and falcons in their retinues. It's 1216. Fasten your seatbelts, and enjoy the ride! And for those of you who enjoy interactive blogging, here's a little pop quiz. This list contains six things that can be found either in Heath's published book or in her work in progress. One of them is her own invention, and the other five are historical, no matter how odd they sound. Can you identify the one that is fictional? 1) A certain saint used to sleep with his head on a stone. His aversion to pillows might have had something to do with his belief that one he had once used, as a guest in a nobleman's home, was possessed by demons. 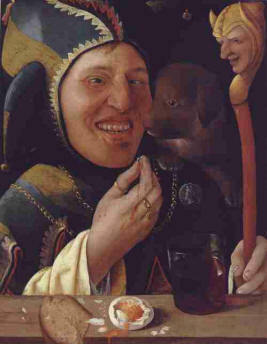 2) A jester played a joke on a knight during a banquet, and by doing so managed to start a civil war. 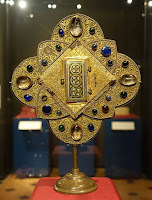 3) A certain pope with a notorious temper used to wear the finger bone of a holy woman in a portable reliquary to prevent him from blaspheming. 4) The women of this town used to communicate information with one another over distances by the way they hung their laundry on the clotheslines - the sequence of items and colors. 5) A wealthy noblewoman used to prepare her special almond cakes for Saint Francis, and he was so fond of them that on his deathbed he asked for some. 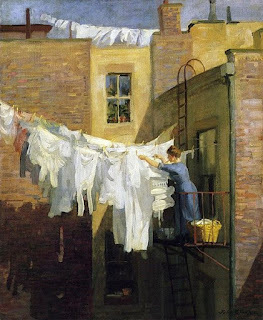 Tinney Sue Heath realized at an early age that she had no domestic talents whatsoever and did not do well with repetitive work of any sort. An aptitude test revealed that she should absolutely not even think about working as a banker or a police officer, but she might have a chance as a musician or a writer. So she went for music and writing, and those have worked out fairly well. She is a fan of medieval music, Leonard Cohen, Italian opera, men's figure skating, logic problems, live theater, and a whole slew of writers, including her inspiration for going into historical fiction, Dorothy Dunnett. She plays several Renaissance and medieval wind instruments and a portative organ, but she can't cope with stringed instruments. If there's no way to blow into it, it's somebody else's problem. She has a husband and son who are totally amazing, and if she never accomplishes anything else beyond having them in her world, it will still have been a rousing success of a lifetime. She never writes about politics online, but sometimes she is very tempted. 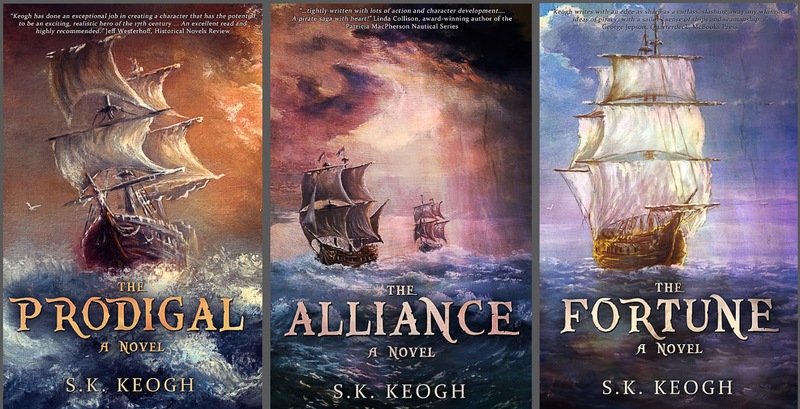 Today I'd like to introduce guest blogger Susan Keogh, author of the newly re-released historical novel The Prodigal and the two novels that follow it (The Fortune and The Alliance). I enjoyed these books tremendously. I've also had the privilege of reading some of Susan's work that has not yet been published, and I can assure you, there's plenty there to look forward to! If you're not yet familiar with this author, you have a treat in store. 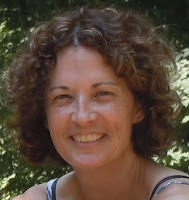 Here's Susan, followed by her book blurb and her guest post. What is the single most important aspect of writing historical fiction? Setting. Setting is the “world-building” that agents and editors talk about when discussing the genre. You can have great characters, but if the reader can’t see, smell, and feel the place where your characters live, the story will fall flat. 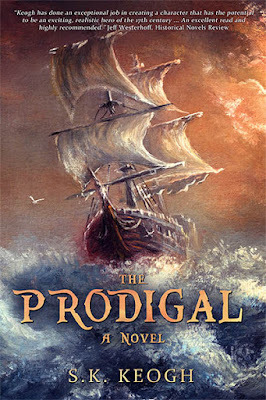 The setting for my 17th century novel, The Prodigal, is split between three places: first and foremost, aboard the Prodigal as she sails the Atlantic Ocean (most of the novel takes place at sea); second, the West Indies; and third, the Colonial province of Carolina (modern day South Carolina). This article will discuss the first and the third. The brig Prodigal was formerly used as a merchant vessel but commandeered for Jack’s purpose: hunting down the notorious pirate who kidnapped his mother. I chose a brig (two masts, compared to the three masts of a true “ship”) because, historically, pirates did not sail the large vessels portrayed in most Hollywood films. Pirates preferred small craft for their speed and maneuverability. They had no need for dozens of heavy guns to overpower their victims because most merchant vessels pirates preyed upon were lightly armed (guns took up valuable cargo space) with small crews (a money-saving measure). 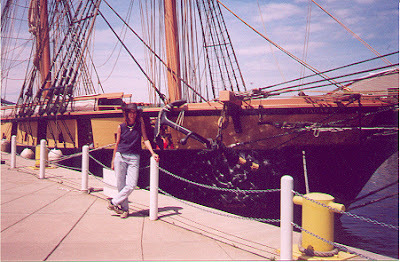 My search to find a replica of a brig for research resulted in my discovery of the Niagara, whose home port is Erie, Pennsylvania. I had the pleasure and privilege of sailing upon her three times, one of those times as a member of the crew. 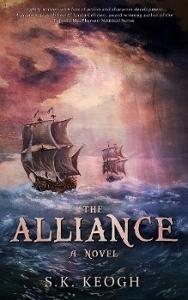 Though the Niagara existed over a hundred years after the era of my story, I was still able to apply much of what I learned about sailing to my 17th century story. If you’d like more information about the Niagara, please visit their website. They offer day sails to the public. Me after my first sail aboard the Niagara. 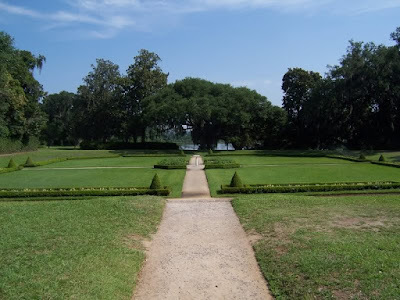 When discussing the setting of Charles Town, Carolina (modern-day Charleston), I don’t want to give away anything about the plot of The Prodigal (I hate spoilers, don’t you? ), so I will keep this a bit broad. 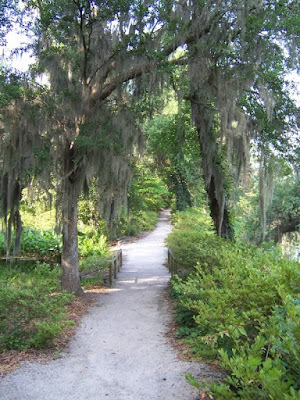 I traveled to Charleston a couple of times during the process of writing my novel. My focus was upon rice plantations and the rice culture, which made the region wealthy in the 1700s. My story takes place in the 1690’s, so in my story I had to portray Leighlin Plantation as a bit ahead of the times in discovering rice cultivation. 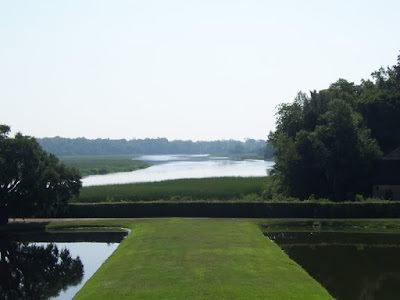 Two invaluable stops during my research were Drayton Hall and Middleton Place Plantation. 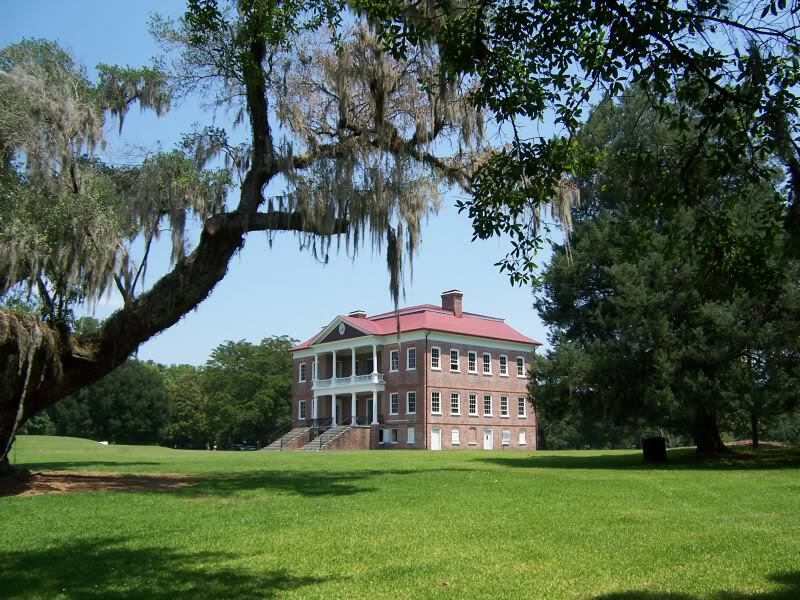 Drayton Hall was such a magnificent house (and so very well preserved) that I decided to use its design for Leighlin House. Leighlin’s land was partially inspired by Middleton Place, situated on a bluff (a rare topographical feature in the “lowcountry” of Charleston) with its beautiful view of the Ashley River. Both Leighlin and Wildwood feature more prominently in the second and third books in the series. But don’t feel it necessary to read The Alliance or The Fortune in order to enjoy The Prodigal. The Prodigal was originally written as a stand-alone novel, but once I reached the rather surprising ending, I found that the characters had much more to tell me, and I couldn’t wait to find out what that entailed. I hope you will feel the same way, too. To purchase The Prodigal or read a free sample, click here. This is a picture of an author in Rome on a research trip, gazing wistfully through a fence at where her main character's home used to be. Lots of stuff lasts a long, long time in Rome. Why couldn't this place? But not a single stone still stood. Which makes this writer quite annoyed. For which he really should be sorry. I wish, I wish it would come back! Of course, this desecration happened in 1588, so at least it's not a recent loss, like the closure of the crypt in Santa Prassede. "For security reasons," like somehow Rome's safety depends on closing off a crypt in an ancient church. Rome is hugely security conscious at the moment; there are lots of guys in military fatigues standing around monuments carrying really large guns and trying to look scary. Anyway, I was in Rome to look up sites associated with the main character of my work in progress. She was a wealthy Roman noblewoman, born into the Normanni family and married into the even more powerful Frangipane family. Definitely the right neighborhood. Though they were actually from the Trastevere district. The "dei Settesoli" part of her name indicates that her husband's branch of the family was the one that owned the ancient monument known as the Septizonium (aka Septizodium). 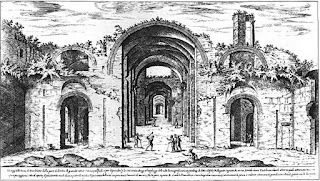 In the middle ages, the Septizonium was fortified and in use by its noble owners, as were the Colosseum, the Circus Maximus, and many other survivors of the classical era. And in Giacoma's day, her husband's family controlled all three of those I've just mentioned, plus a triumphal arch or two. A lot of status was involved in controlling ancient monuments, and the Frangipani were no slouches when it came to public relations. Unfortunately, over the years Rome has sometimes been rather cavalier in the treatment of its past. 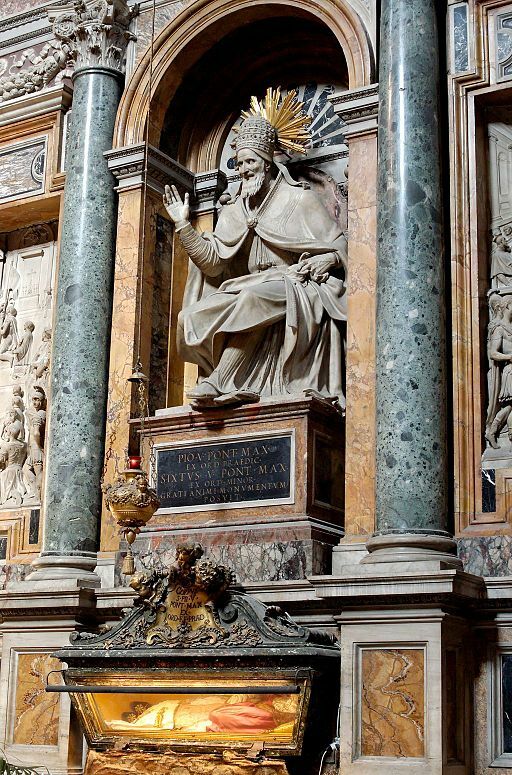 When it comes to the admonition "Reduce, Reuse, Recycle," Rome was particularly big on the second one. Romans used to burn ancient stone monuments to generate lime to make mortar to stick other bits of ancient stone monuments together into newer stone monuments. This happened a lot. It's only the middle ages. Let's get it out of the way to show off all this cool classical stuff. It's so old-fashioned. Let's baroque it! It needs a bunch of cherubs and vines and glitz. Ooh, look! Nice rocks. Shiny! Let's use those. I think Sixtus was probably expressing #3 when he had the Septizonium ruins torn down in 1588 and bits reused here and there and hither and yon. So what, exactly, was this Septizonium thing, anyway? And where was it? The "where" is pretty easy to answer, but the "what," not so much. 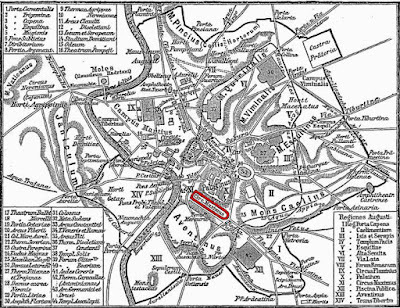 It was located on the southern corner of the Palatine Hill, just a stone's throw from the Circus Maximus (which was, remember, also owned at that time by the Frangipani). As for what, there's a fair bit of debate about that. 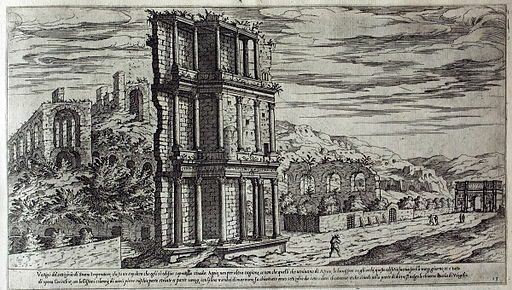 We do know that it was constructed on the orders of the Roman emperor Septimius Severus, and what we see pictured, the ruins that survived into the 16th century, appear to be an elaborate facade. As to its original purpose, I've seen it described as a palace facade, a nymphaeum, a temple, a fountain, a place to display statues, or having "no known practical purpose." Whatever it was, it was in ruins by the 8th century. It had been incorporated into a fortress long before the Frangipani took possession. But we don't know what form that took - whether it was a tower-house, or strictly a defensive bastion. Did people live there? Did Giacoma? It is widely assumed that she did, but I have my doubts. More on that later. This picture shows the Septizonium as a romantic ruin. It isn't really that close to the Colosseum, though. It is said that the Roman senator Matteo Rosso Orsini housed the cardinals in the Septizonium, a ramshackle ruin, and kept them in a room where the rain leaked in, along with the malodorous results of Orsini's guards relieving themselves up on the roof. It is further said that the cardinals were deprived of proper food, servants, and doctors, and that they suffered mightily. One, from England, died. 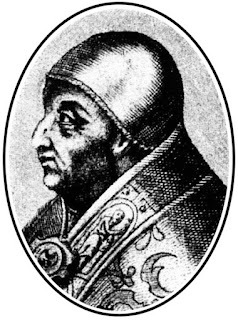 The rest stuck it out for two months, however, and finally elected Pope Celestine IV, who had been nobody's favorite candidate at the outset. Celestine may have been the worse for the experience also, for he lasted only 17 days before he died, not even making it to his coronation. I am personally inclined to think that this didn't happen in Giacoma's Septizonium. 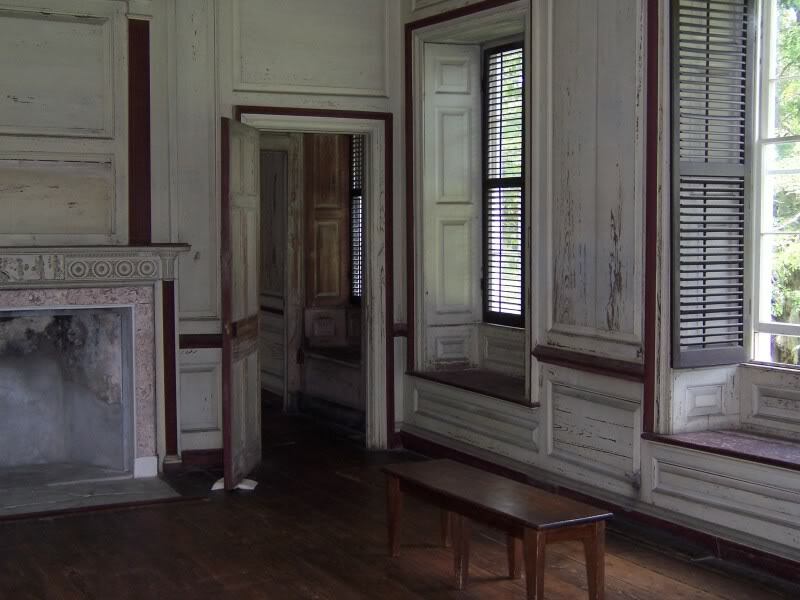 For one thing, if it had indeed been her home, or even her property, I find it hard to believe it would have deteriorated that much only two years after her death. 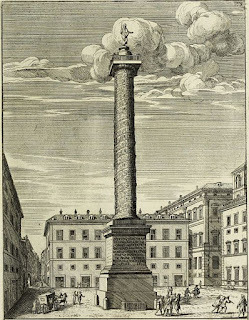 For another, we still don't know if there was ever anything more to the Septizonium than an elaborate colonnaded facade, so there may not have even been any place to put the cardinals. The similarly-named Septisolium (aka Heliogabalum), on the other hand, was a much more commodious place, a monastery which had been used previously for papal elections. 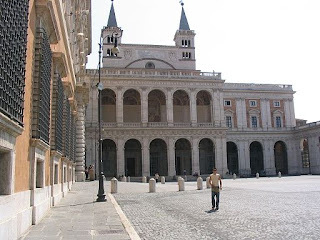 It seems likely that this was the location of the conclave, and that the cardinals were perhaps not as ill-used as reports suggest, though certainly some of them were there (wherever "there" was) against their will. 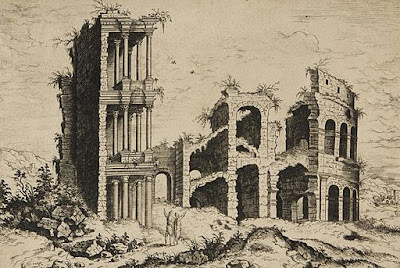 So there I was in Rome, with no Septizonium to look at, and not even the certainty that Giacoma did indeed live in the structure that used to be there. But I take a Canadian Mountie approach to my on-site research ("We Get Our Septizonium! "), so we weren't done yet. 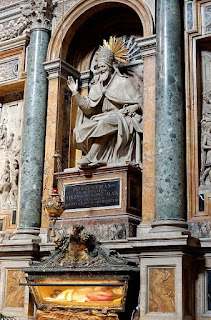 I happened to know where some of the pieces of the Septizonium had gone, when Pope Sixtus V had it razed, so off we went, looking for the bits. These weren't the only places, but you get the idea. 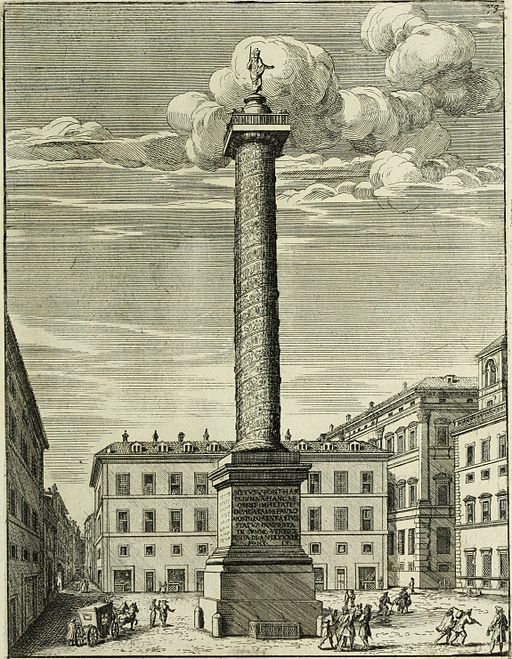 Giacoma's Septizonium was spread all over Rome. The destruction had cost Sixtus 905 scudi, but he got a lot of marble, travertine, and columns out of the deal. It was a disappointment, though not a surprise. 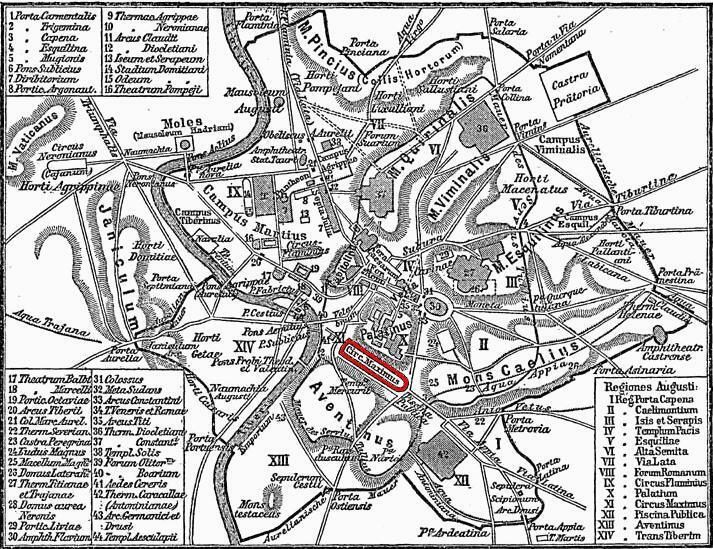 But since I was becoming increasingly convinced that her actual home was probably located in the Circus Maximus, I still had something to explore, and that exploration turned up a wealth of information. More about that in my next post, but meanwhile here's a picture of the Frangipani tower that still stands (hurray!) in the Circus Maximus. We'll explore that next time. 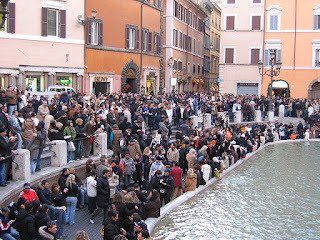 My husband and I have recently returned from several weeks in Italy, and I find myself thinking about the frustration, fascination, and sheer fun of trying to communicate in a language other than my native English. 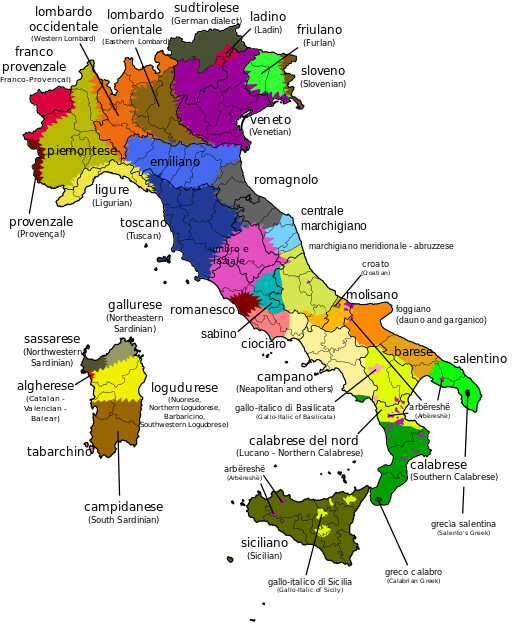 My language status: I am not fluent in Italian, but I get by reasonably well. I read the language better than I speak it, because (1) I read it all the time when doing research for my writing, and (2) I am a hopelessly self-conscious speaker, and forgetting one word or being uncertain of a verb tense is enough to silence me, because I want it to be perfect. Depending on where you go in Italy, chances are that many people will speak to you in English. Yes, they'll know you speak English. With me, they take one look at my sensible shoes and my total lack of fashion sense, and the lightbulb goes on over their heads, and the thought balloon says "English! I can practice my English!" Meanwhile, I am thinking, "This is my chance to speak Italian!" So off we go, with the Italian person speaking imperfect English to me and me speaking imperfect Italian to him. This results in some rollicking conversations, and it really is a lot of fun. We tend to spend a lot of time in smaller towns, towns with less of a tourist presence than the major cities, and there I find it is genuinely useful to have some grasp of the language. The hostess at our agriturismo this trip, for example, didn't have any English, so communication depended on my skills, which for the most part were there when I needed them. People in train stations tend to speak train English; people in restaurants speak restaurant English; people in museums speak museum English, and so on. 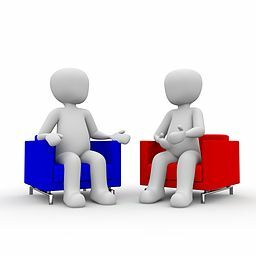 This is fine for a while, but it's pretty easy to veer off course if the conversation goes anywhere even slightly unusual, and then we're all out of our depth. I had one conversation with a shopkeeper on this trip that resulted in the two of us exclaiming "Brava!" to each other and sharing high fives, all because she remembered some obscure weirdness in English (I don't remember which, we have so many), and I managed to do something fairly sophisticated in Italian ("Woo-hoo! Correct use of the subjunctive AND a reflexive verb, all in one sentence!"). Me (pointing to something on the menu): What is this? Him: It is a vegetable. I do not know the word in English. Me: Okay, maybe I'll have the artichokes, then. Him: It is green, and it looks like grass. Me: Or how about the eggplant? Him: It looks like grass, but it is cooked. It is like cooked grass. Him: It is like green grass that is cooked. Yes, it is like grass. Me (sighing): Okay, I'll have the cooked grass. Electronics seem to have a harder time than I do, for the most part. I had occasion to type a couple of emails in Italian while we were there, and I hadn't figured out how to disable Autocorrect on my iPad, so the results were odd, to say the least. My cheery "Buon giorno!" got corrected into "Buon ginormous," and my comment that we were running late ("in ritardo") came out as "in Ricardo." I mentioned that we had a rental car ("macchina"), but the iPad decided it was a "macchiato." 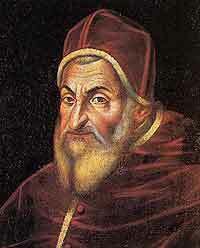 And when I wanted to speak of "nostra partenza" (our departure), it absolutely insisted that I must mean "Nostradamus partenza." I therefore wish all of you a very buon ginormous, hope that you don't find yourselves in poor old Ricardo, and suggest that if you are in need of a macchiato, you consider buying it instead of renting it. I have no idea what to do about Nostradamus. Lots of people didn't, as I recall. And then there was our GPS. When we were in Greece a couple of years ago, we named our GPS lady with the British accent Cassandra, on the grounds that nobody ever listened to her, either. This time I wanted to call her La Compiuta Donzella, after a 13th century Tuscan poet, but my husband kept referring to her as the Madonna della Locazione Globale, and that stuck. Her main problem was pronunciation. GPS: Continue for 7 kilometers to Seena. 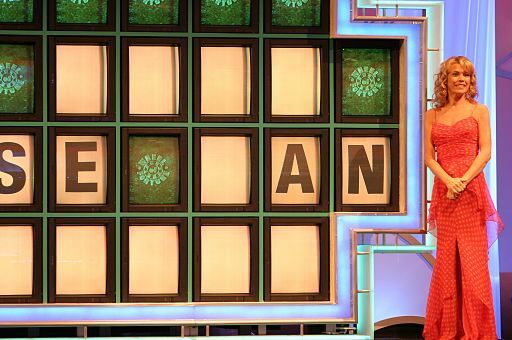 Me: It's SiEna, you electronic dingbat. GPS: Take the exit to Chiuso. Me: Chiusi, not Chiuso. Who programmed you, anyway? Me: MonTALcheeNO?!? Get a grip, lady! It's MONtalCIno. GPS: Take the next left toward Seena. My husband, by the way, has picked up a smattering of Italian along the way, but once in a while he still comes up with a howler. My favorite was the train ride when we were trying to figure out what stop we were passing, and he saw the sign that said "Vietato attraversare i binari." "I got it!" he announced. "We're in Vietato." I almost hated to point out that "Vietato attraversare i binari" means "It is forbidden to cross the tracks," but I couldn't resist observing that a town named "Forbidden" didn't sound like a really great place for our vacation. Then there are pronunciation issues. The Italians don't do too well with the letter H, a voiced glottal fricative. So, when we're checking in somewhere and I need to give them our name (Heath), I spell it out: "Acca come hotel, E come Empoli, A come Ancona, T come Torino, e un'altra Acca," and they make a heroic effort to say the name, and it comes out as "Signora Heat." This is because even worse than the H, which they work at, is the digraph TH, the voiced or unvoiced dental fricative. That just isn't an option. Favorite example: in Pienza, a few years ago, a pleasant young woman was showing us through the Palazzo Piccolomini. 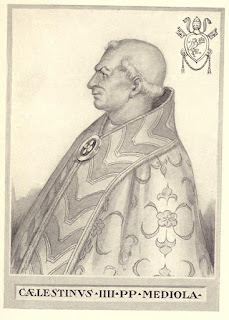 We managed to be thoughtful and studious and nod appropriately as she told us the history of various Piccolomini popes and their predecessors, and we were fine with Pius the First, and with Pius the Second. But every time she got around to "Pius the Turd," we had to be sure not to look at each other, lest we lose it, which would have been rude. I'll close with the charming, if slightly askew, comment by the church sacristan who was showing us around the sanctuary of a church that has a connection to my work in progress. He was quite indifferent to us at first, but he warmed to us when I for once remembered to murmur "Permesso," before walking through the door he had just opened for us. While it may seem strange to Americans to request permission to enter a space you have already been invited into, it is in fact a rather subtle custom, a way of saying, "I acknowledge that this is your space and not mine." An Italian would have done it without thinking. I've had to train myself. But he immediately dropped his guard, and we began one of those dual language conversations that when you try to remember them, you can't recall what was said in which language. 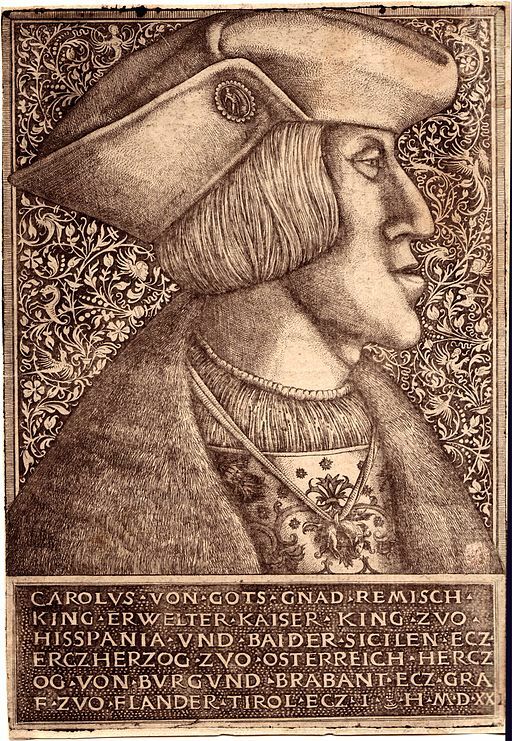 I mentioned my main character - a historical person, but not one many people have heard of - and his eyes widened, and he proceeded to rattle off her history in rapid Italian. He didn't tell me anything I didn't already know, but what he said was accurate, and at that moment there was a real sense of connection between us. So when we parted, he shook my hand and smiled at me and, in English, wished me "Merry Christmas!" It was the week before Easter, so he had missed by a bit, but that was fine. We settled on "Buona Pasqua," and parted as friends. 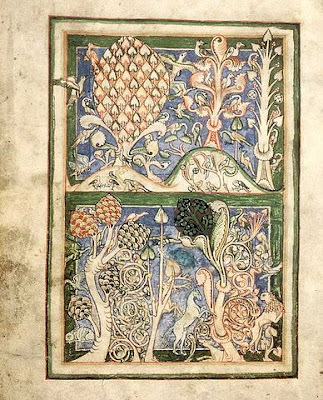 The illustration above, as well as the one at the top of this post, is from the medieval manuscript containing the famous Carmina Burana song collection (ca. 1235). 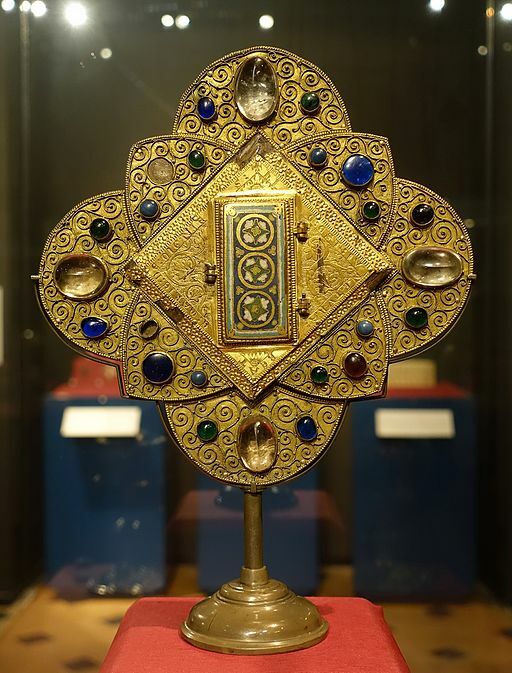 Benjamin Bagby, leader of the medieval music group Sequentia, has described this collection as evidencing "an almost obsessive fascination with Fortuna." Consisting of bawdy and satirical songs from the 11th, 12th, and 13th centuries, mostly in medieval Latin but with some of the poems in other European languages, Carmina Burana may well have originated with the irrepressible Goliards, young clerics, often second sons cut off from inheritance and therefore given over to the church despite a lack of vocation. Many of the poems, most of which are anonymous, satirize the Church. 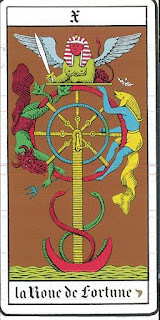 O Fortune, changing and unstable, your tribunal and judges are also unstable. 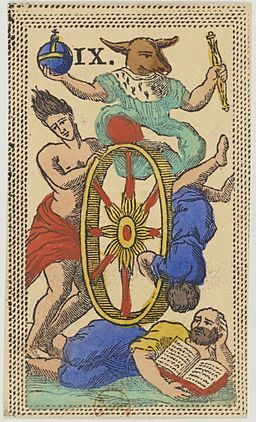 You prepare huge gifts for him who you would tickle with favors as he arrives at the top of your wheel. But your gifts are unsure, and finally everything is reversed; you raise up the poor man from his filth and you make the loudmouth into a statesman. 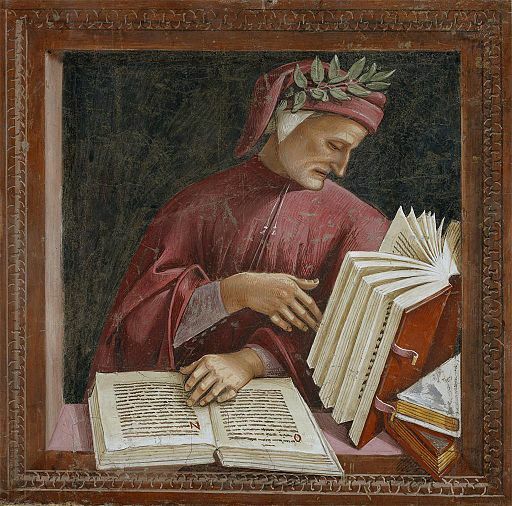 It's in the seventh canto of the Inferno that Dante's guide, Virgil, explains to him the nature of Fortune. 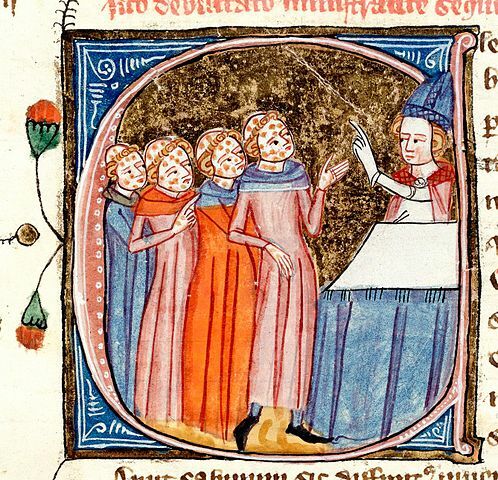 Dante asks Virgil, "This Fortune that you touch on here, what is it, that has the goods of the world in its clutches?" but she is blessed in herself and does not listen: with the other first creatures, she gladly turns her sphere and rejoices in her blessedness. Dante the author (as opposed to Dante the character) has made Fortune a Divine Intelligence, a "general minister and leader" - or, as Dante scholar Christopher Kleinhenz says, "an angel, above rebuke." 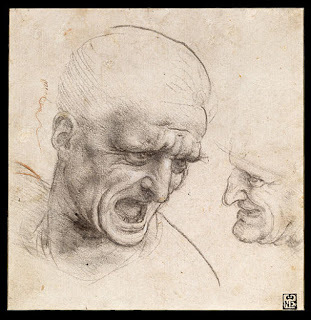 This exchange occurs as Dante and Virgin approach the fourth circle, where the avaricious and the prodigal are punished. 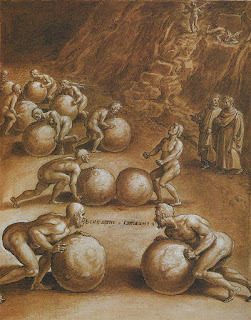 These damned souls must roll huge stones in opposing directions, moving in a semicircle. When they meet head-on, they clash, then turn and retrace their steps. Thus, they never complete a circuit. Unlike Fortune's wheel, they can never go full circle. Giovanni Boccacio draws on Boethius for his concept of Fortune's double nature in his lesser known works. Of his masterpiece, the Decameron, Teodolinda Barolini writes, "The Decameron could be pictured as a wheel - Fortune's wheel, the wheel of life - on which the brigata turns, coming back transformed to the point of departure." The tales told on Day 2 of the Decameron especially seem to depend on the unpredictability of Fortune (cf. Andreuccio). 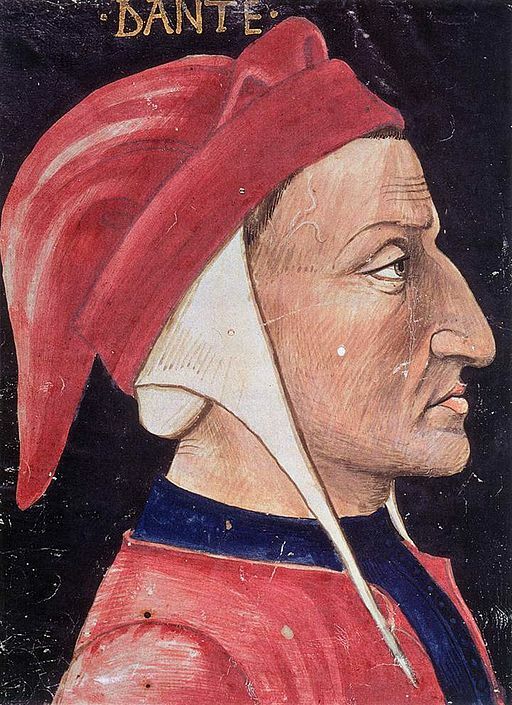 Vincenzo Cioffari observes, "In Boccaccio this disinterested tranquility of Fortune is substituted by a mischievous and interested cunning... In the Decameron the primary function of Fortune is to determine the outcome of a course of action..."
Boccaccio, says Cioffari, does not limit himself to discussing wealth and power as Fortune's sole currency, but adds to them the idea of sensual pleasures. Still, Boccaccio sees Fortune as an instrument of Divine Will. As Cioffari says, "Far from being blind it has a hundred eyes because, although its activity may not be apparent to Man, it is carrying out the Divine Will just as much as Nature." Boccaccio's Fortune is a capricious woman, ever-changing, whimsical. 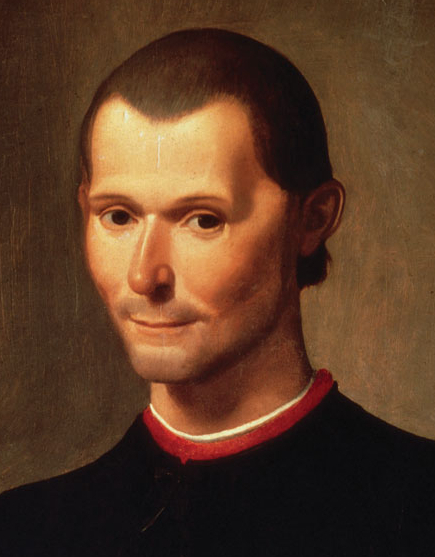 Unsurprisingly, Niccoló Machiavelli's concept of Fortune is less noble than Dante's and less playful than Boccaccio's. You could almost describe it is cynical, or perhaps - Machiavellian. It is not unknown to me how many men have had, and still have, the opinion that the affairs of the world are in such wise governed by fortune and by God that men with their wisdom cannot direct them and that no one can even help them... Sometimes pondering over this, I am in some degree inclined to their opinion. Nevertheless, not to extinguish our free will, I hold it to be true that Fortune is the arbiter of one-half of our actions, but that she still leaves us to direct the other half, or perhaps a little less. Machiavelli's Fortune has a total disregard for human feelings. Her actions appear cruel, but in truth are the result of indifference. She does not favor personal glory and is apt to target the successful, arranging for an ignominious fall just as her victim approaches his goal. She prefers discord among men. Cesare Borgia, for example, was born under a Fortune of "extraordinary and extreme malignity." Here we venture into the area of mechanical wheels. Unfortunately, I've not been able to find illustrations that are both useful and available, so we will have to content ourselves with a couple of descriptions. 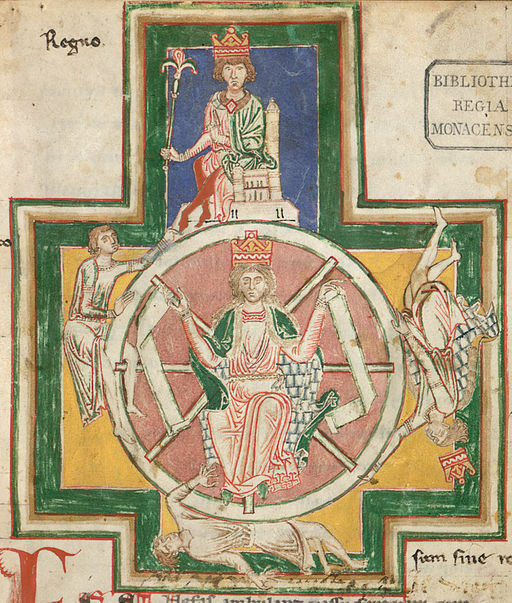 Then, in the same church, I saw a wheel, which by some means unknown to me descended and ascended, rotating continually. At first I took this wheel to be an empty thing, until reason recalled me from this interpretation. I knew from this evidence of the ancient Fathers that the wheel of Fortune - which is an enemy of all mankind throughout the ages - hurls us many times into the depths; again, false deceiver that she is, she promises to raise us to the extreme heights, but then she turns in a circle, that we should beware the wild whirling of fortune, nor trust the instability of that happy-seeming and evilly seductive wheel: concerning these things those wise, ancient doctors have not left us uninstructed. By revealing these things, they have brought us to understanding. 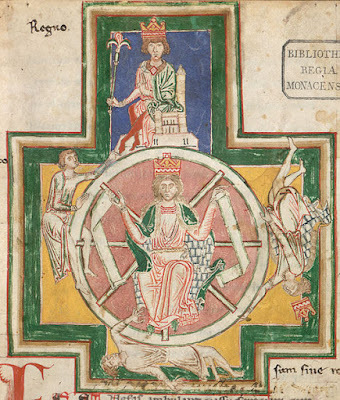 An enactment of the Wheel, complete with four realistic figures of rising and falling kings, appears in a drama by Adam de la Halle (Jeu de la feuillé, first produced in Arras in 1276). 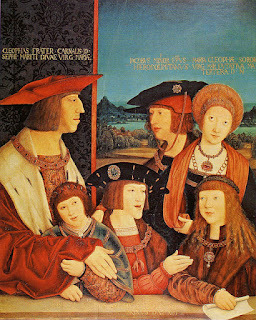 Live actors, however, stole the show in a morality play by Antoine Vérard published in 1498 (though performed as early as 1439). 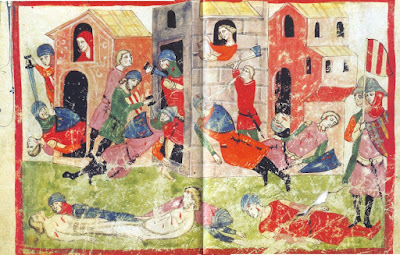 In this play, called Bien-Advisé Mal-Advisé, the figures at the Regnabo and Regno positions experience the torments of Hell, while Regnavi and Sine Regno achieve salvation. 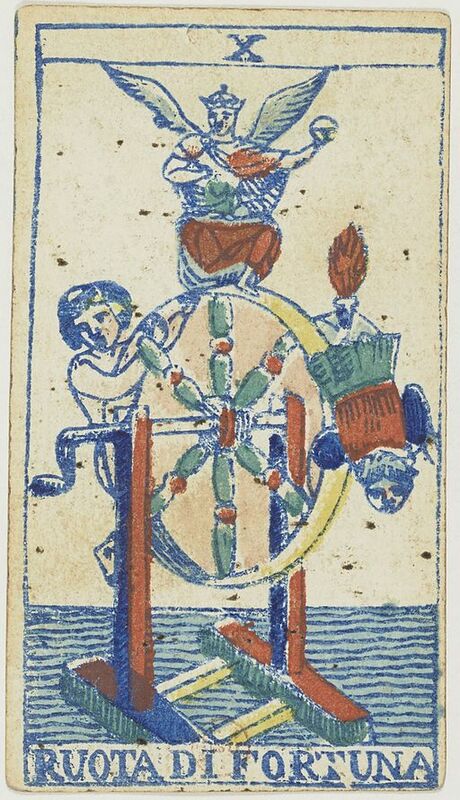 Be that as it may, the pageant featured a Wheel of Fortune with two Virtues in attendance, who were able to assist the young monarch in bringing the Wheel to a standstill. A second Wheel in another part of the pageant featured Extravagance, the god Mars, the City of Bruges (played by a woman), and Negotiation. 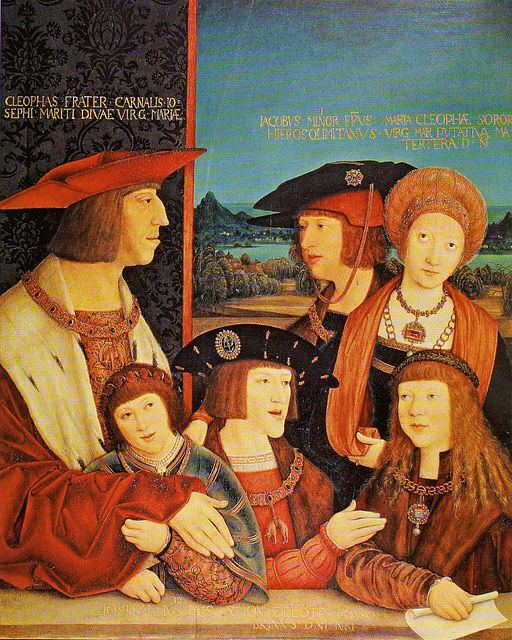 It has been said that Shakespeare's history plays draw heavily on the idea of the Wheel, particularly the Richard II - Henry IV - Henry V sequence, with Richard on top in the Regno position at first, and Bolingbroke occupying the Regnabo spot. Raymond Chapman, a Shakespearean scholar, notes all the "up and down" imagery in those plays, which he calls "a relentless alternation of rise and fall." 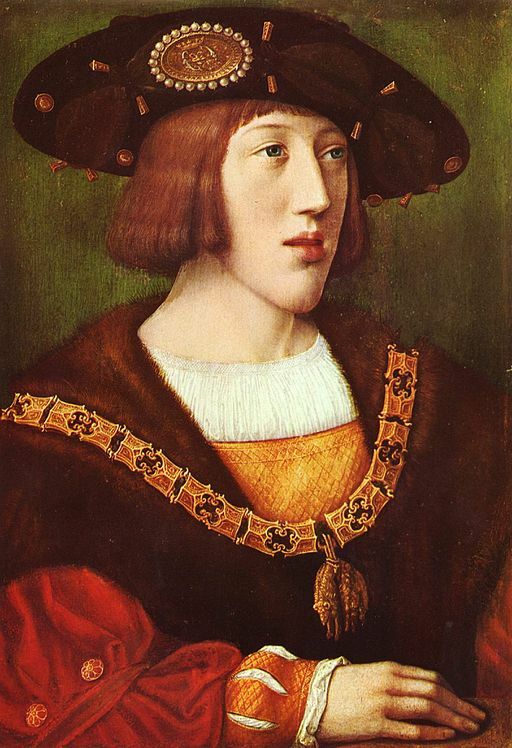 Or, as Richard himself says, "Conveyors are you all, that rise thus nimbly by a true king's fall." Howe all the riders alway hange in doubt. Lyves temperately for feare of blockam feast. rulyth all Englande under a hogge.